I need to thank my friend Thuy for sending a food recommendation my way in the form of a vegetarian restaurant. OK…Full disclosure here…I am far, far from adopting a nut and berry diet. Though in Vietnam our furry friends produce some of the most vile cuts of meat ever known to fester in a street market bucket and cause me to ponder joining a vegan compound, I still do enjoy the more sanitized varieties such as boneless, skinless chicken breast. The problem is these more benign cuts just aren’t readily accessible without some work culling them out of the depths of Saigon’s grocery scene. 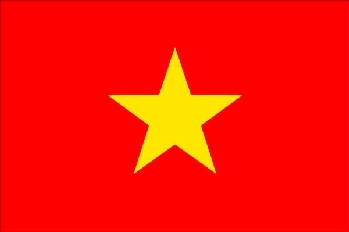 Au Lac Healthy World Restaurant at 237 Xo Viet Nghe Tinh in the Binh Thanh District comes to the rescue with its modern, clean, airconditioned and indoors setting. In other words, these aren’t my normal street lunchtime surroundings and sitting down at a real table with linen napkins feels strange indeed. The prices are right at two to three bucks per main, and led me down the path to the lemongrass snails. This begs the question of how in the world do they do a vegetarian snail? We’ve sampled these types of vegan substitutes before at the temple in Saigon (lunch #85) and the restaurant in Hanoi (lunch #72). My third foray into these “meats” is a hit as well. 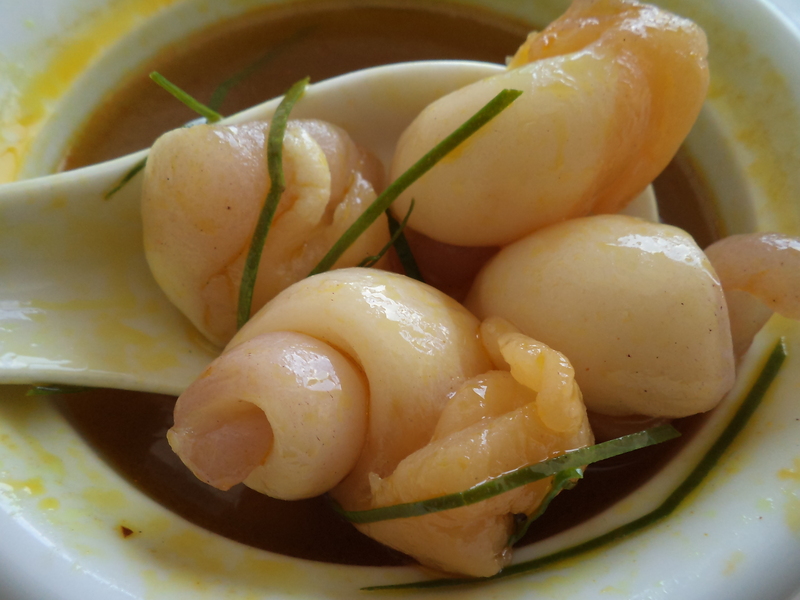 The eight pink and white “snails” floating around in a slightly sweet brown broth actually looked like their swamp based cousins right down to the rubbery chew factor. Well, they look real with a healthy dose of imagination. Imagination or not, the best part of the vegan versions is no pesky shell or slimy poop parts needing to be torn away. The dipping sauce is perhaps the most enjoyable component of this dish. It’s a nuoc cham all right but not one based of fermented fish. How they turn soy something or another into a tangy liquid is beyond me, but it’s good. 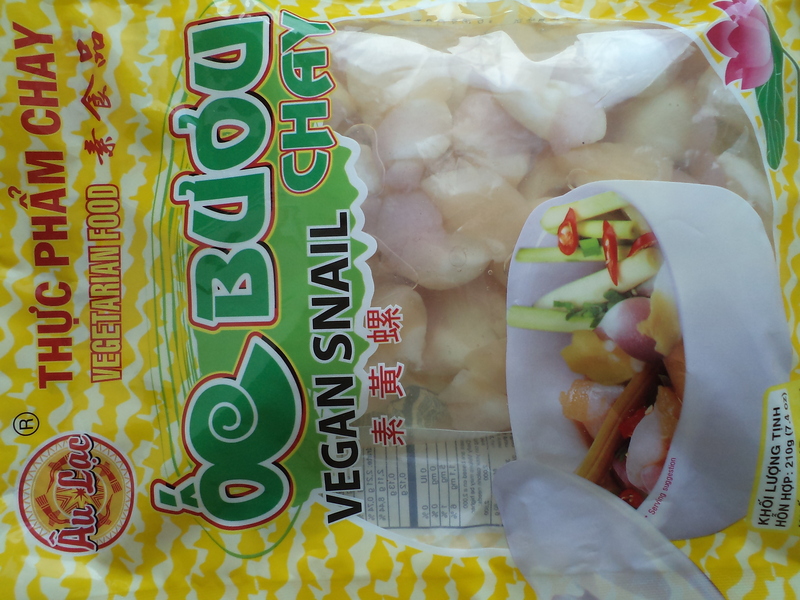 Shhh…Don’t tell anyone but I think I may prefer the vegetarian snails and fish sauce better. We’ll just keep this our little secret. Of course the vegan snails did not really spawn in a rice paddy or more likely some sewage laden canal on the outskirts of Saigon, but eating the factory made, konjac powder version actually feels a bit safer without the worry if this is the meal to finally do a digestive tract in. And at least with the fake versions we can sample items we’d normally otherwise never touch in a million years such as cow stomach or duck eggs.